Headteacher Joe Mitchell with pupils at Orchard Head Junior, Infants and Nursery school, which has been rated 'good'. 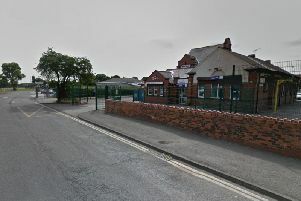 Orchard Head Junior, Infants and Nursery School was given the rating for the second time running since it was taken over by Pontefract Academies Trust. Newly appointed headteacher Joe Mitchell was praised for “wasting no time in identifying what is working well” with inspectors finding a “shared ambition and enthusiasm among staff among staff and governors for the school”. Mr Mitchell said: “We are pleased with the inspection outcome as it reflects the school is moving in the right direction. “We are also pleased that Ofsted recognised our determination to improve the school and address our areas of weakness”. Mr Mitchell, who took over in January, believes the school is in a strong position to continue its improvement. He added: “As part of a multi-academy trust we benefit a great deal from shared systems and collaboration with the other five primaries and the support we receive from the trust school improvement team. The inspection report said that “parents are buoyed by recent changes in leadership and have a positive view of the school”. As part of the inspection, Ofsted sought the views of pupils and found they were “unanimous in their view that they enjoy school and have good attitudes to learning”. After inspectors met with governors and the trust they said that all are “united in their ambition to ensure that the school continues to improve”. Tom Fay, executive director of teaching and learning at Pontefract Academies Trust, said: “The outcome for the school, Joe and his team is extremely positive. “We thank staff and pupils for their hard work and look forward to further supporting the school in their journey of continuous improvement”. Ofsted said steps were being taken to improve attendance at the school, which is below the national average. Ofsted’s report said: “Overall attendance has continued to rise steadily this year and is much closer to the national average. For its next steps, Ofsted said the school must make improvements in teaching, learning and assessment to enable more pupils, particularly middle-ability pupils, to reach the standards they are capable of in reading and maths. It also said pupils, especially those of lower-ability, needed more supported from staff to form their letters correctly when writing.